One of the liveliest debates in neuroscience over the past half century surrounds whether the human brain renews itself by producing new neurons throughout life, and whether it may be possible to rejuvenate the brain by boosting its innate regenerative capacity. Now UC San Francisco scientists have shown that in the human hippocampus — a region essential for learning and memory and one of the key places where researchers have been seeking evidence that new neurons continue to be born throughout the lifespan — neurogenesis declines throughout childhood and is undetectable in adults. "We find that if neurogenesis occurs in the adult hippocampus in humans, it is an extremely rare phenomenon, raising questions about its contribution to brain repair or normal brain function," said Arturo Alvarez-Buylla, PhD, the Heather and Melanie Muss Professor of Neurological Surgery at UCSF, whose lab published the new study March 7, 2018 in Nature. Alvarez-Buylla — a member of the Eli and Edythe Broad Center of Regeneration Medicine and Stem Cell Research at UCSF, the UCSF Weill Institute for Neuroscience, and the UCSF Helen Diller Family Comprehensive Cancer Center — is a leading expert in brain development who over the past 30 years has played a key role in convincing the scientific establishment that new neurons are born throughout life in animals such as songbirds and rodents. In recent years, however, the Alvarez-Buylla lab and others had already cast doubt on whether neurogenesis persists into adulthood in the human olfactory bulb, as it does in rodents, and have shown that while new neurons integrate into the human frontal lobe after birth, this process also ends during early infancy. The lab's new research, based on careful analysis of 59 samples of human hippocampus from UCSF and collaborators around the world, suggests new neurons may not be born in the adult human brain at all. The findings present a challenge to a large body of research which has proposed that boosting the birth of new neurons could help to treat brain diseases such as Alzheimer's disease and depression. But the authors said it also opens the door to exciting new questions about how the human brain learns and adapts without a supply of new neurons, as in seen in mice and other animals. Rodents and Songbirds Produce New Neurons Throughout Life, but Do Humans? It was once neuroscientific dogma that the brain stops producing new neurons before birth. In the 1960s, experiments in rodents by Joseph Altman, PhD, at MIT first suggested that new neurons could be born in the adult mammalian brain, but these results remained highly controversial until the 1980s, when Fernando Nottebohm, PhD, at Rockefeller University, conclusively showed that new neurons are born and put to use throughout life in several parts of the songbird brain. As a graduate student in the Nottebohm lab at the time, Alvarez-Buylla contributed to understanding the mechanism of adult neurogenesis in songbirds. These findings launched a whole field of research aimed at understanding how new neurons contribute to brain function in other animals and exploring the potential therapeutic effects of boosting brain regeneration in humans. Much work has focused on a region of the hippocampus called the dentate gyrus (DG), where rodents produce newborn neurons throughout life that are thought to help them form distinct new memories, among other cognitive functions. Rodent studies have shown that DG neurogenesis declines with age, but is otherwise quite malleable — increasing with exercise, but decreasing with stress, for example — leading to popular claims that we can boost brain regeneration by living a healthy lifestyle. Animal experiments have also suggested that neurogenesis-boosting therapies could treat brain disorders of aging such as Alzheimer's disease, and leading researchers have proposed that antidepressant medications like fluoxetine (Prozac) may work by increasing DG neurogenesis. Beginning in the late '90s, a handful of studies reported evidence of adult neurogenesis in the human brain, either by estimating the birth dates of cells present in postmortem brain specimens or by labeling telltale molecular markers of newborn neurons or dividing neural stem cells. However, these findings, some of which were based on small numbers of brain samples, have remained controversial. In particular, researchers have questioned whether the limited number of markers used in each study were truly specific to newborn neurons, and have suggested alternative explanations, such as the inadvertent labeling of dividing non-neuronal cells called glia (which are well known to continue regenerating through life). In the new study, Shawn Sorrells, PhD, a senior researcher in the Alvarez-Buylla lab, and Mercedes Paredes, PhD, a UCSF assistant professor of neurology, led a team that collected and analyzed samples of the human hippocampus obtained by clinical collaborators on three continents: Zhengang Yang, PhD, in China; José Manuel García Verdugo, PhD, in Spain; Gary Mathern, MD, at UCLA; and Edward Chang, MD, and Kurtis Auguste, MD, at UCSF. The brain specimens included 37 postmortem tissue samples and 22 surgically excised samples from patients who had been treated for epilepsy. Sorrells and Paredes analyzed changes in the number of newborn neurons and neural stem cells present in these samples, from before birth to adulthood, using a variety of antibodies to identify cells of different types and states of maturity, including neural stem cells and progenitors, newborn and mature neurons, and non-neuronal glial cells. The researchers also examined the cells they labeled based on their shape and structure — including imaging with high-resolution electron microscopy for a subset of tissue samples — in order to confirm their identity as neurons, neuronal stem cells, or glial cells. The researchers found plentiful evidence of neurogenesis in the dentate gyrus during prenatal brain development and in newborns, observing an average of 1,618 young neurons per square millimeter of brain tissue at the time of birth. But the number of newborn cells sharply declined in samples obtained during early infancy: dentate gyrus samples from year-old infants contained fivefold fewer new neurons than was seen in samples from newborn infants. The decline continued into childhood, with the number of new neurons declining by 23-fold between one and seven years of age, followed by a further fivefold decrease by 13 years, at which point neurons also appeared more mature than those seen in samples from younger brains. The authors observed only about 2.4 new cells per square millimeter of DG tissue in early adolescence, and found no evidence of newborn neurons in any of the 17 adult post-mortem DG samples or in surgically extracted tissue samples from 12 adult patients with epilepsy. 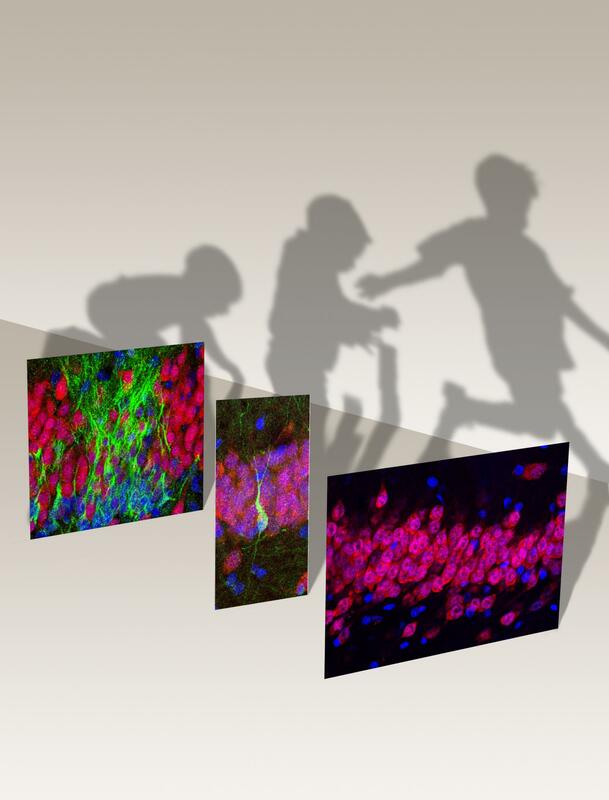 "In young children, we were able to see that substantial numbers of new neurons continue to be made and integrated into the dentate gyrus, but neurogenesis fades away completely by early adolescence," Paredes said. "The fact that we could compare newborn brains, where new neurons were clearly present, to the adult, where we saw no evidence for young neurons, gave us added confidence that what we were seeing was correct." The researchers then turned to studying the stem cells that give birth to new neurons. They found that neural progenitors are plentiful during early prenatal brain development, but become extremely rare by early childhood. They noted that these cells fail to cluster early on into a concentrated "niche" in a region of the human DG known as the subgranular zone (SGZ). The researchers suspect that this configuration, which is seen in mice, could be necessary for prolonged neurogenesis, suggesting a potential explanation for why neurogenesis falters by adulthood in humans. The authors acknowledge that however comprehensively and carefully they searched, it would be impossible to definitively show that there are never any new neurons in the adult hippocampus. "But I think that we need to step back and ask what that means," Sorrells said. "If neurogenesis is so rare that we can't detect it, can it really be playing a major role in plasticity or learning and memory in the hippocampus?" The absence of neurogenesis in the human brain may not be a bad thing, the researchers point out, but instead point the way to understanding what makes the human brain distinct from other animals and set researchers on a better path to developing treatments for human brain diseases. After coming full circle in the study of neurogenesis, from playing a role in proving its existence in other animals, to demonstrating that it appears not to play a major role in humans, Alvarez-Buylla is philosophical. "I always try to work against my assumptions in lab," he said. "We've been working on adult neurogenesis so long, it is hard to see that it may not happen in humans, but we follow where the data leads us." Other authors on the study were Kadellyn Sandoval, Kevin W. Kelley, PhD, David James, Simone Mayer, PhD, Kurtis I. Auguste, MD, Edward Chang, MD, Arnold R. Kriegstein, MD, PhD, Michael C. Oldham, PhD, and Eric J. Huang, MD, PhD, of UCSF; Arantxa Cebrian-Silla, PhD, and José Manuel García-Verdugo, PhD, of the Universidad de Valencia and Antonio J. Gutierrez Martin, MD, of the Hospital Universitario La Fe, in Valencia, Spain; Dashi Qi and Zhengang Yang, PhD, of Zhongshan Hospital at Fudan University in Shanghai; and Julia Chang, PhD, and Gary W. Mathern, MD, of David Geffen School of Medicine at UCLA. The UCSF researchers were supported by the National Institutes of Health (F32 MH103003, K08 NS091537, P01 NS083513, R01 NS028478), the UCSF Weill Institute for Neurosciences, and a generous gift from the John G. Bowes Research Fund. Alvarez-Buylla is a co-founder and serves on the scientific advisory board of Neurona Therapeutics.